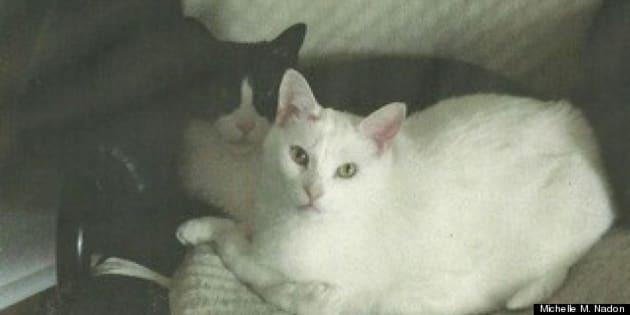 Angelo and Simone need a new home as their owner has recently lost a loved one in her life, and now needs to relocate and cannot take her pets with her to her new shared space. Angelo is approximately four and half, and Simone is approximately five years old. 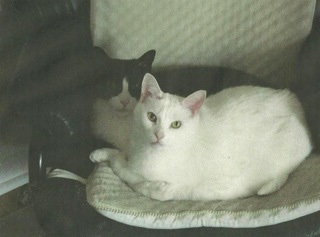 Angelo (b/w) and Simone (white) need a new home as their owner has recently lost a loved one in her life, and now needs to relocate and cannot take her pets with her to her new shared space. Angelo is approximately four and half, and Simone is approximately five years old. 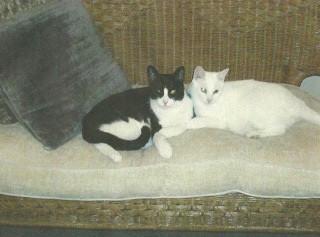 They were adopted when Simone was around one year old and Angelo was about six to eight months old. They are lovely indoor pets: they both LOVE to play, are active and clean. Simone is very social and often joins her owner when company comes and takes her place on a chair to sit and "chat" with them. Angelo prefers to check out company first and joins in when he decides he is ready. They have a toy box and choose their toys daily -- especially Simone who scatters her toys everywhere each day while she enjoys running around amusing herself with her favourites. They are often seen grooming each other.